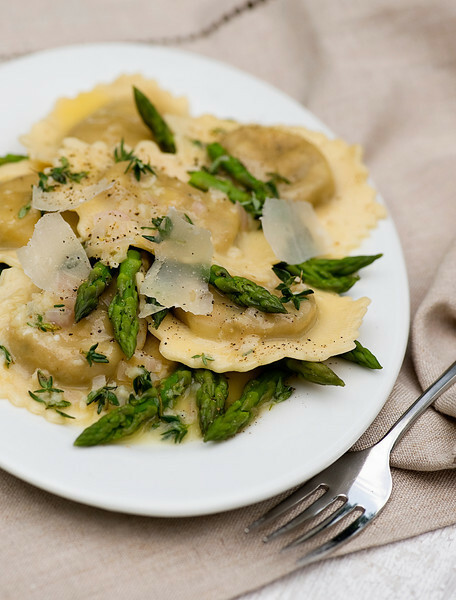 This recipe for ravioli with white wine butter sauce shows how fresh ravioli is perfect with a delicate sauce and some tender asparagus tips. Elegant and easy! First things first. I haven’t done a giveaway in a while now, have I? Let me answer that: no, I haven’t! And so I’m going to do one, and guess what I am giving away this time? Here’s a hint: see that plate of scrumptious ravioli with white wine butter sauce and asparagus tips? Yep. I’m giving away ravioli. And not just ravioli….keep on reading! This recipe all started a few weeks ago when the wonderful folks at Buitoni emailed me to say they were having fun reading my blog (Whee! I instantly love anyone who tells me that! Don’t say I didn’t warn you!) and they wondered if I might wanted to work up a couple of recipes for them to go with some new pastas they had just come up with. One was a chicken marsala ravioli, and the other was a butternut agnolotti. Did I have any ideas? Did I have any ideas? When do I NOT have ideas? I had many, many ideas. So they sent me over some of their pasta so I could mess around with it in my kitchen, and just to help me along, they sent me one of these. I can always use a beautiful new cutting board, especially when it comes from my favorite cooking store on the planet, the fabulous JK Adams in my beloved state of Vermont. Talk about finding your way into a girls heart…chicken marsala ravioli AND kitchen goods. Now I was even more determined to do right by this ravioli. Now, the ravioli itself is pretty dang fabulous – it’s fresh pasta stuffed with a mixture of chicken, marsala sauce, mushrooms and other good stuff you get in traditional chicken marsala. So I wanted the sauce to be something nice and light that added to the elegant taste without overpowering the delicious taste of the ravioli stuffing. I also wanted to be able to use some of the gorgeous summertime herbs and veggies that are all around us these days…and so with those two things in mind, I worked up an easy, silky white wine and butter sauce with a handful of fresh thyme and parmesan cheese to give it a little subtle kick. And just for good measure and to make sure we got our veggies, I added in some asparagus tips (which you can cook for a minute or two right in the pasta water!). All of this comes together in less than a half hour, making this an elegant dish for either a festive Saturday dinner party OR a treat at the end of a long regular old Tuesday. So! While this sauce will work perfectly well with pretty much any kind of ravioli, and you should definitely try it with the cheese variety too, I know you want to try it with the chicken marsala variety, right? 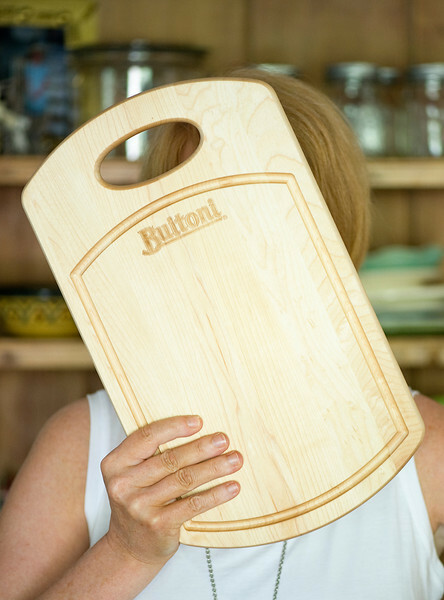 So here’s what I have for you: I have THREE vouchers for a free package of Buitoni refrigerated pasta (which will get you this scrumptious ravioli or any of their other chilled pastas), and not only that, I have three of those gorgeous JK Adams cutting boards to go along with it, all compliments of my friends at Buitoni. Because you really need something beautiful to cut that asparagus up on. Here’s what you need to do: Leave me a comment below telling me your favorite pasta dish (this way I also win, because I am always, always, always looking for new pasta ideas), and on Saturday, July 21 at this very time I will do a special blog post announcing the lucky winners. In the meantime, you don’t have to wait to make this scrumptious dinner, because the recipe is at the end of this post, and if you live in the Northeast or New England areas of the USA, the chicken marsala ravioli is waiting patiently for you in the refrigerated section of your supermarket. (If you don’t, don’t worry, because again, this sauce works with whatever ravioli catches your fancy.) And if you win, you’ll just have to make it again. I know, ravioli with white wine butter sauce twice in a row…the things we have to do. So here’s the recipe…bring on your pasta ideas! This giveaway is now closed…but I’d still love to hear your pasta ideas if you have ’em! One bunch asparagus (about 15-20 spears), trimmed and cut into two inch pieces. You can use just the tips or if you like lots of asparagus, use the stems as well! Bring a large pot of water to a boil. Add salt and olive oil, and then asparagus. Cook asparagus until just crisp-tender, about 2 minutes, and remove asparagus with a slotted spoon, leaving the water boiling. Add one tablespoon of butter to a medium size skillet and melt over medium heat. Add shallots and garlic and stir until soft, 2-3 minutes. While the sauce is cooking, add the ravioli gently to the boiling asparagus water (I like to lower them in with a slotted spoon) and cook according to package directions until just done, about 6 minutes. Remove with a slotted spoon and put in a single layer on a plate until the sauce is finished. Divide the ravioli between two plates, and tuck the asparagus tips in between the ravioli. Drizzle a generous portion of sauce over each serving, garnish with fresh thyme and shaved parmesan and serve at once! My absolute favorite pasta dish is pasta carbonara! Although this recipe looks pretty delicious as well! This looks amazing! But one of my absolutely favorite pasta recipes is actually the Naked Ravioli you posted here ages ago! My family loves it and I still make it all the time! I love pasta! My favorite would probably be pasta carbonara, but I love anything with a light/white sauce! Favorite pasta? Pasta Positano! I made up the name for a pasta recipe I found using spaghetti, olive oil, garlic (steeped in the oil), lemon juice, lemon zest, fresh basil, roasted grape tomatoes and, of course, parmesan cheese. It’s a lemony, summery delight which reminded me of Positano, the little town perched high above the Amalfi Coast. Favorite pasta dish of all time is blackened chicken alfredo..home made alfredo sauce tossed with tender pasta.. then I blacken flattened chicken breasts and slice them on the bias.. top the pasta with chicken and a sprinkling of fresh diced tomatoes (or if you like tomatoes like I do, more than a sprinkling).. its amazing. Maybe shave some parm on top of that… I think I just figured out whats for dinner tonight! One of my old favorite pasta dishes is one I had at JMac’s on St. Simons Island, GA, years ago. The restaurant’s still around, but the dish is long gone. It was a bow tie pasta with lobster, asparagus and shiitake mushrooms in a sherry cream sauce – yum! My favorite pasta is Spinach Fettucini in a Poblano pepper and Cilantro cream sauce and topped with Gouda cheese. Pasta Puttanesca!! It’s got a great saltiness in it from the anchovies and capers. And the recipe comes from one of my old favorite cookbooks – Silver Palate. I know it’s boring and certainly won’t inspire you- but I love spaghetti and (turkey) meatballs!!!! Portabello marsala sauce over wild mushroom agnolotti and pecorino is my favorite! My favorite pasta dish is linguini with red clam sauce, either with fresh clams or, in hurricane-prone Miami, it can be made with all canned ingredients when the power is out. My favorite pasta dish is: sautee sliced garlic and red pepper flakes in olive oil. Add in a bunch of Kale. Then Squeeze in a lemon. Toss with spaghetti, chopped olives and feta. Love this! My favorite pasta dish is SO simple yet SO delicious . . . wide ribbon pasta cooked al dente … swirled (while hot) with some good olive oil, fresh lemon juice squeezed on top with fresh cracked pepper & curls of parmesan. Heaven! My mother had two dishes that she could make: meatloaf and mashed potatoes and spaghetti and meatballs. Thus, I am a purist and associate spaghetti and meatballs with my dear mother and how she would make it for my birthday and homecomings from camp and assorted special occasions. She made the best meatballs. They were thick and hearty and huge, made from the highest grade of ground beef and rolled with onions and spices and had cheese in the middle. They were first cooked in the oven and then finished on the stove in a pot of marinara. She put them over pasta and generously sprinkled fresh grated parmesan reggiano over the top. It was my mother’s masterpiece. My favorite pasta (although I love all kinds!) is Voodoo Pasta….with blackened chicken, cajun seasoning, onions, peppers and tomatoes in a white wine/cream sauce. To die for! Hm, I think I’m making it this weekend.. This recipe looks gorgeous and light (for a pasta dish). As far as my favorite pasta dish goes? Anything with basil-marinara sauce. Ravioli is always great and it’s sooo easy to make a huge batch and freeze it for later! Although Gruyere mac & cheese is always up there, my newest favorite is a recipe off of Skinnytaste (http://www.skinnytaste.com/2008/03/meatball-and-spaghetti-soup-5-ww-pts.html). Doubled the recipe, switched out the ground turkey for ground beef, and I used beef broth. Oh. My. Goodness. It’s seriously spaghetti and meatballs as a yummy, comforting, tummy-filling soup. Oooh that looks good. I am going to have to go with linguine al pesto (again, like the spaghetti and meatballs fans, a little “common” but — hey! it’s summer!). In the winter, along with spaghetti and meatballs, I do a “pumpkin pasta” that is dead easy using canned pumpkin, garlic (and maybe onions? can’t remember) sage (or thyme or rosemary), cream (or fat-free half-and-half); with a thicker long noodle like bucatini. And parmesan duh. my fave is jumbo shrimp, scallops & sun-dried tomatoes with pesto sauce, served over linguine…I dream of it.. I am a HUGE fan of anything warm pasta (which means NO PASTA SALAD YUCK!). But I’m sorry to say that I cannot remember the name of my current favorite pasta dish. All I know is that it has a light bright lemony white sauce with capers and usually chicken served over linguni. it is SO yummy! My parsley plant had a growth spurt so I made some pesto with it. we bought some fresh ravioli and mixed the pesto into good ol’ cream sauce and the toddler ate it up. so that right now is our fav. when the toddler eats everyone’s happy. Fettuccine Alfredo, preferably with seafood. One of my favorite pasta dishes would definitely be a veggie lasagna!! I love a good Chicken Parmesan. I know that doesn’t qualify to most as a pasta dish – but I consider pasta to be imperative to a good Chicken Parm. Without it, something is missing. A fresh bright marinara is best! My favorite pasta dish is lasagna, preferably with vegetables. So classic, yet delicious! That recipe is the PERFECT pairing for those ravs! I got sent the butternut agnolotti and I’m doing some recipe testing this weekend…you’ve made me THAT much more excited about it! A good carbonara. Even better if I don’t have to make it! home made mac’n’cheese, hands down! family favourite which can be dressed up with shrimp and veggies or left plain, which is what the kids prefer, but it’s a crowd pleaser any time of year! One of my favorite pasta dishes is one that I got at a local restaurant called Indigo. It’s a simple Cheese Ravioli with Lemon Vodka sauce. My oh my. Deeeelish! I just love pasta. While is was living in Europe, I used to buy buitoni all the time. They are one of the best brands. This surely looks delicious. Great post! My favorite pasta is mushroom ravioli (Buitoni makes a wonderful one) with a mushroom cream sauce. In case you can’t tell… I love mushrooms! I love a good carbonara (no peas tho!) using fresh eggs. For a ravioli sauce, I prefer a creamy wine sauce, maybe with some lobster chunks. My grandmother made the most wonderful homemade raviolis, which she served both naked and with a tomato-based sauce that simmered all day on the stove. I was the official taster to test whether or not they were done. What a tough job……Raviolis bring back memories of family meals with her. My favorite pasta dish to order out is butternut squash ravioli. My favorite pasta dish to make at home is baked lemon pasta (a pioneer woman recipe). My daughter requests this meal weekly! We often add shrimp or chicken to this dish also. Cut up a bunch of tomatoes and put in a bowl with basil, garlic and olive oil. Let sit for a few hours. Cook pasta (I use penne) and drain. Stir in feta cheese and top with the tomato basil mix. Great for all the summer tomatoes and basil. Mmmm my favorite pasta dish this summer has been some fresh diced tomatos, and what ever other veggies I have laying around sauteed and simmered down with a little butter and chicken stock! Nice and light to beat the heat and fullfilling my need for pasta!! I love good spinach ravioli’s with a light sauce. I love thin spaghetti with Mizithra cheese and browned butter sauce. I love this recipe Kate… Can’t wait to try it. I love any pasta. Although last week, I ate my most favorite pasta dish yet. Carmela’s Chicken Rigatoni from Macaroni Grill. I immediately came home to find the copycat recipe. It was on the Food.com site and I made it last night: It is still to die for!!!!!! Even my husband, who is not a fan of pasta, has requested I make it again. I guess I’d have to say linguini with white clam sauce…. or maybe stuffed shells! pasta with clam sauce and carbanara….sheesh, now i am hungry! My husband make a mean ravioli too! I think this might be my new favorite sauce! I can’t wait to try it with some fresh pasta, vegs and maybe some mushrooms. I have two favorite pastas: carbonara and lobster mac and cheese. However, I really like fresh pasta tossed with just about anything, especially fresh vegetables. Oh my – this looks delicious! Can’t wait to try it. My favorite pasta dish is Pasta Primavera. Nothing better than spring veggies and a light sauce with your favorite pasta – yum, Now I’m hungry! I love to use Costco’s Bruschetta over any of the cooked pasta, adding a jar of drained capers, and black olives. Serve with warm, crusty, garlic and Parmesan cheese French or Italian bread. Great Summer meal! Yummmm! Pasta primavera- what a great way to eat summer veggies! If using lnk sausage, remove from casings and combine in a large pot and brown. While browning sausage, add onions and garlic. Drain fat from the meat and add the rest of the ingredients except the cheese. Simmer for 30 minutes or longer to let the flavors blend. Top with a little mozzarella and parmesan! My husand make a great summer pasta taking advantage of the garden. Tomatoes, garlic, fresh herbs and zucchini. Smells great, looks great tastes Great!! Any pasta dish is my favorite, doesn’t matter which one!!! Will definitely have to try this recipe — sounds wonderful. Thanks. My favorite is from Simply Recipes by Elise. Fettuccine with Creamy Tomato Italian Sausage Sauce. I serve it often for company and always have requests for the recipe and/or compliments. Love it! I love all pasta, but my favorite is angel hair pasta with bolognese sauce! I love love love seafood carbonara! I love a creamy pasta with shrimp and scallops. My husband is so not a seafood lover, so when we go out I make sure to order something loaded with that! We were in Italy earlier this summer, and I have to say that one of the best pasta dishes we had was spaghetti in olive oil and red pepper flakes. So simple, yet so delicious! Orzo Pasta with Everything!! Epicurious recipe. A great salad any time of year. Just beware of Chinese pine nuts – I’ve had pine mouth and it is awful! So, I’m not going to be able to help you much with the new recipe b/c my favorite pasta recipe is the spaghetti with garlic butter wine sauce and bread crumbs!! Could seriously eat it every week I love it so much!! An all time fave that I can’t get anymore is my late father-in-law’s Turkey Tetrazzini. He was a hospital chef, and prided himself on making good food that was always simple and flavorful, both at work and home. Even if we had his recipes, we couldn’t match his years of experience at turning fresh ingredients into wonderful meals. Just one of the MANY reasons why we miss him!! This looks good, but my favorite pasta dish is probably roasted vegetables with pasta and a mozzarella/olive oil sauce. Yum. My #1 favorite pasta dish is my granny’s chicken spaghetti. Creamy, spicy, cheesy, deliciousness. Comfort food at its best. I love puttanesca and any pasta with multiple gooey cheeses and earthy mushrooms baked with it. Since pasta is my favorite thing it is hard to pick one….so I’ll give you a few of my favorites. My first love is plain old spaghetti & meatballs but I have a few others that I love too. 3) Bucatini all’Amatriciana (Spaghetti with Tomato, Pancetta and Pecorino Romano Cheese) I made this in a Sur la Table cooking class and it is awesome and simple. 4) Ravioli topped with kale sauteed in olive oil, white wine, tomatoes and garlic. I can’t believe I forget to mention another favorite is Ina Garten’s Summer Garden Pasta. That is unbelievably good and simple, simple, simple! My favorite pasta dish is spaghetti and meatballs. I love ravs, but my favorite pasta dish uses pesto and fresh garden peas (roasted tomatos, chicken, and other additions help too)! Your blog is so fun to read and very inspiring. Thanks! Fave pasta dish is capellini pomodoro using fresh Romas right out of the garden and basil from the herb pot. Don’t even cook the tomatoes; just chop them up and toss in some great olive oil and a little salt and pepper with the pasta and call it dinner. With a glass of wine, of course! my favorite pasta dish is my homemade chicken Alfredo- it’s nothing fancy, but very good. My favorite is either mac and cheese with gruyere and white cheddar, or sundried tomato pesto. Yum! My favorite pasta dish is lasagna. I make it with shredded fresh spinach mixed in with the ricotta, and cream cheese. I use 4 cheese Italian blend shredded cheese and a fire-roasted vegetable spaghetti sauce. In addition to the shredded cheese I also sprinkle some fresh greated parm/romano cheese and fresh chopped basil on top before baking. Yumm!! I like to chop a fresh garden tomato, mix with pesto, and put it on top of warm pasta with a little bit of past water. Add lots of salt and fresh ground pepper. Fast and easy. My favorite involves angel hair or orzo with fresh home grown tomatoes and summer squash, sliced Vidalia onions, a little olive oil, and fresh shredded Parmigiano Reggiano. Oh, and fresh garlic. Saute onions in oil until a wee bit browned, add chopped veggies and garlic, a splash of red wine, simmer for a few minutes, serve over freshly cooked pasta with plenty of cheese. My fave is my husband’s baked spaghetti dish. I just forwarded this recipe to the husband to make tonight to go with my Buitoni ravioli. Who knows what I’ll come home to, but I hope it’s good! I just found your website while searching for a simple pasta sauce for some chicken ravioli we had on hand. This sauce was perfect! It was simple, and I had everything on hand. Made the sauce while the water heated – the timing was great. Glad I found you – better late than never! Looking forward to following your blog. Happy holidays! Hello….Just saw this recipe and thought I would try it. I have some lobster ravioli that I have at home and I’ll definitely let you how it turns out. Wish me luck. Made today with fresh picked asparagus…added some pre-cooked mushrooms to the sauce, did not have thyme [I am at the cottage] so just put more pepper and garlic in. Very good and so easy. thank you. Pasta with vodka sauce is always the winner! Onions, garlic, and a jar of marinara, a splash of vodka, and some cream. Some things are best the simplest. From there you can add anything you want to dress it up, but you’ve got a great starter. Delicious! I made it over lobster ravioli, and substituted with ingredients I had on hand. I used sliced Bok Choy instead of the asparagus, and added oregano to the thyme. It was terrific! Oh, I love the idea of adding bok choy to this – I have to try that! Any pasta or ravioli with a wine cream sauce, a squeeze of lemon, a couple handfuls of fresh spinach (Will wilt & steam in hot pasta) & a sprinkle of perm or pecorino. Yum! Love the idea of changing this up with fresh spinach! Thanks Kathryn! Hey Lauren – I’m so sorry this didn’t work for you! But I appreciate the feedback, and I’m going to adjust the recipe to have that first step to suggest medium heat rather than medium high.